In the early days, this blog started as a water cooler for my friends around which we could discuss the latest films. 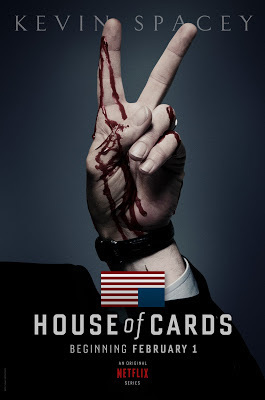 Given the rush of emails, tweets and general hoop-la, I thought I'd break convention and review Netflix' new long-awaited new series, House of Cards. I come to it with some prejudice: the original British novel by Michael Dobbs and subsequent TV adaptation penned by Andrew Davies and starring Ian Richardson is seen by many as the high water mark in Thatcher era TV. It was scabrous, radical, dark, dark, dark. Richardson's Francis Urquhart seemed like an embodiment of all that we saw as sinister (yes, even us Thatcherites) in the ruthlessly ambitious, free-market Thatcherite years. And, of course, his catchphrase, "You might think that, but I couldn't possibly comment" became the "Tuckerism"" of it's day. The original House of Cards was part of a long and beloved tradition of high quality political satire and drama that the UK seems to excel at - stretching from Yes, Minister to Thick of It. Having seen the latter defanged as HBO's Veep, I was sceptical about yet another US remake. That said, one couldn't argue with the quality of the cast and crew. David Fincher, master of visual style and complex technical material (THE SOCIAL NETWORK) at the helm; Beau Willamon, political playwright, doing the screenplay; Kevin Spacey in the Urquhart role, starring as the scheming Democratic Whip; and Robin Wright as his perfect political wife Claire.